One thing I love about the culture we live in is that it’s never been easier to make extra money on the side, or work from home entirely! Over the past decade I’ve coached thousands of women who run their own successful businesses, and as a result, they don’t have to sacrifice their dreams and passions to make money for their families. We live in a side-gig economy where over thirty million Americans are working as freelancers or contract workers. In the last decade alone, women-owned businesses have grown more than 60%—and that number is growing fast. With the growing popularity of websites like Etsy and Pinterest, women are turning their passions into profits now more than ever before. Maybe you’ve been enduring the drudgery of a J-O-B and you dream of doing something more exciting and fulfilling, like opening your own Etsy shop or photography business, or doing graphic design that doesn’t feel so corporate. Or maybe you struggle with feeling like you’ve lost yourself in motherhood and all of your many responsibilities. Somewhere between scrubbing peanut butter off the drawer handles for the forty-seventh time and hauling overflowing laundry baskets around day in and day out, you forget the things you used to love before life got so busy. …women are turning their passions into profits now more than ever before. I talk to women every day that are in your shoes, and I’ve been in them myself many times as well. Here’s the great news, though: You don’t have to stay there. There’s more for you than just getting by. The same God who put the stars in the sky also put the hairs on your head and a dream in your heart. That’s why I know there’s fulfillment waiting for you in work that you love. I help women step by step to turn their hobbies and ideas into businesses so that they can make money doing what they love. Here are five steps to turn your hobby into a business. What’s your motivation for this? Do you want to bring in extra income for your family or have more flexibility? Maybe you need a creative outlet in your life or maybe you want to keep your skills sharp. Knowing your Why is one of the most important parts of starting a small business. Not only will it help you get through the tough times, but your Why even affects things like your marketing and policies. Simon Sinek says, “People don’t buy what you do; they buy why you do it.” So you better know why you do it! It’s not having too many things to do that overwhelms us. It’s not knowing what to do! That’s why you need a plan to turn your hobby into a business. A plan shows you how to get to where you want to go. That’s actually exactly why I wrote my book, Business Boutique. Cover to cover, it’s a step-by-step plan to give you everything you need to start, run, or grow your business to the level that you want to. When you start with the end in mind, it helps you define your version of success and prevents you from accidentally crossing someone else’s finish line. When you’re starting a business, no matter how small, it’s going to take some resources. It will take your time, your energy, possibly some of your money, space in your home, and a portion of your schedule. But these aren’t just your resources—they’re your family’s too. The last thing you want is to lean into your dream and push your family away in the process. That’s why you need to get your family on board early in your process. This brings a new sense of unity to your family because you’re all a team running toward the same goals together. You’re not good at everything—no one is! And you’re going to be the most successful in business if you stay in your strengths. For everything else, get help. You can backfill for your weaknesses by surrounding yourself with people that are strong in areas that you are weak. Whether that means bartering with a writer to write copy for your website or hiring someone to clean your house so you can ship out more orders, you can get creative to free up time and focus on doing what you enjoy. This not only allows you to be more successful and have more fun as you work in your gifts, but the quality of the business will be higher as you have people helping you that are also working in their strengths. Starting a business may sound overwhelming, but it’s really just a series of tiny baby steps. So don’t get overwhelmed by everything you need to do—just take the first step. Write the first blog. Make one hair bow or paint one painting. Help one person with their bookkeeping, tutor one student, put that first quilt up for sale, or conduct one coaching session. Each step will give you confidence to take the next step. And as you take one tiny step after another, before you know it, you’ll actually be running your business! It doesn’t have to feel like a terrifying leap one day. Just take it one tiny step at a time. Each step will give you confidence to take the next step. Pursuing your passion isn’t selfish; it’s smart. In fact, I believe that when you use your gifts and talents, you’ll become a better wife, mom, friend, and leader. I love the quote by Meg Meeker that says, “The most powerful way to teach a daughter how to enjoy life is to let her see her mother do the same.” See, if we want our families to be happy, we have to be happy ourselves first. And in my opinion, there’s no better way to do that than by pursuing your passion to do more of what you love. 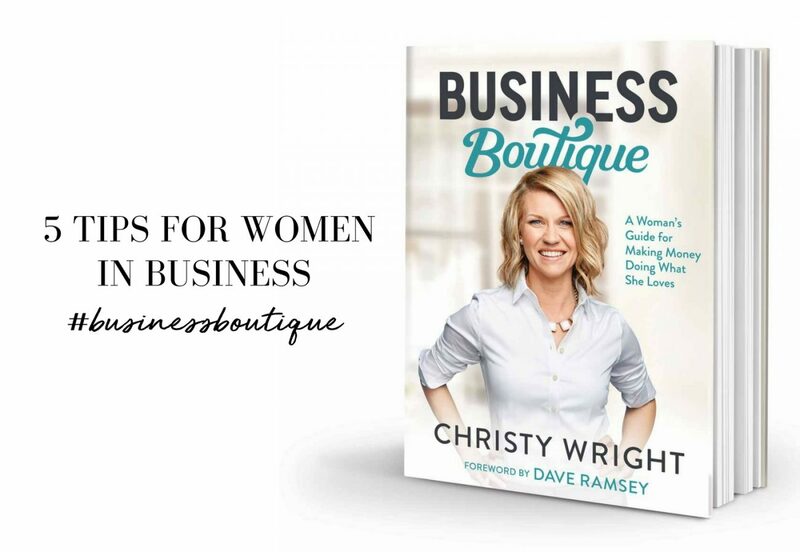 Author, Business Woman, Host, and Certified Business Coach are just some of the hats Cristy wears while pursuing her passion for equipping women with the knowledge to run and grow a business.